I have a lot of posts started, but this one, from two years ago during Advent, caught my eye a few days ago. 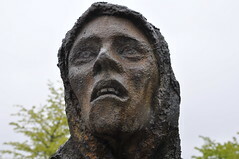 It is every bit as timely now as it was then, right down to the reference to famine in North Korea (to say nothing of humanitarian crises in other parts of the world), and so I share it again today as food for thought. very shameful to live in this world while some people starving to death and have nothing while others just wasting rather than helping. the photo on the top is one of the most powerful ones that tells everything in single view how sad. this shows how careless we are and how selfish we are we even can watch a death of person. You don’t have to have answers. You’re having the conversation, with us and your children. That’s what matters–that we don’t forget, that we keep looking for answers, together, and do what we can in the meantime as you are. Great post. Bless you. Thank you. Yes, it’s the search that matters most, but that’s hard to take sometimes. Sometimes you just want things to be better!